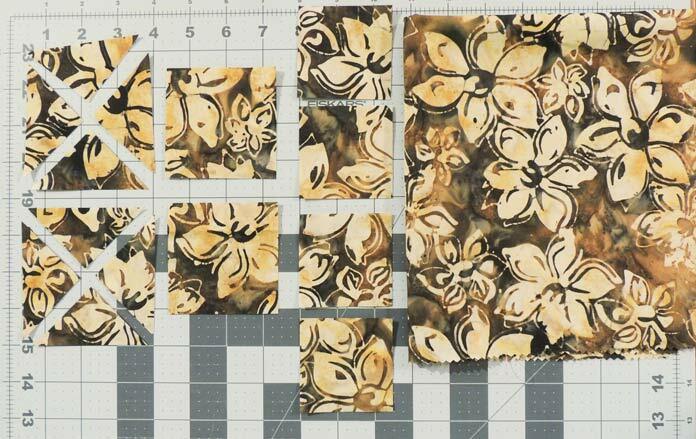 I’m quickly becoming a lover of batik fabrics and I have Northcott fabric to thank! 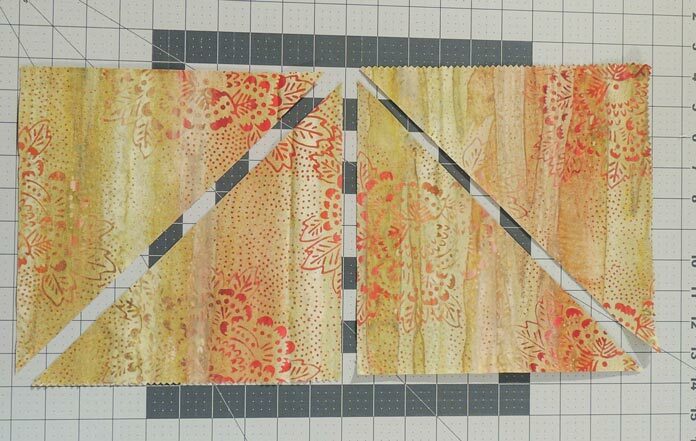 A new line from Banyan Batiks called Mary is coming to quilt shops this month. This one is beautiful! Large florals, dynamic block printing, and the colors! I tried to restrain myself this month but I’m not sure I succeeded. 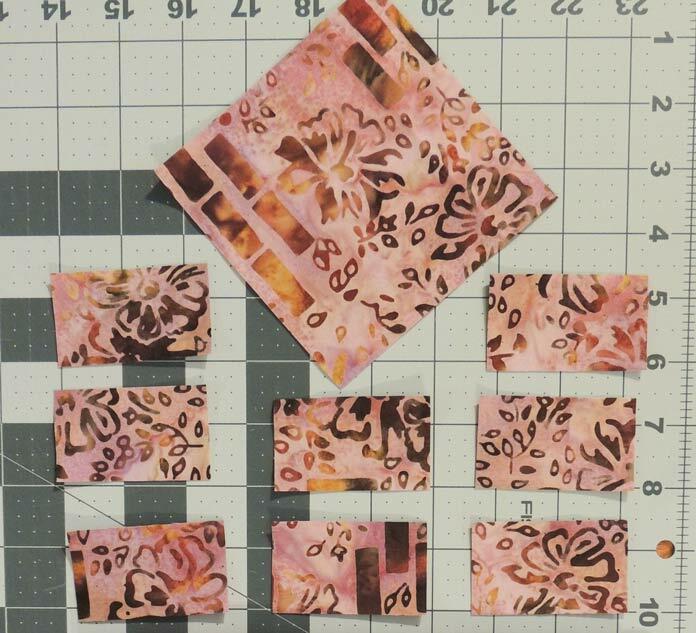 I had designed this block several months ago and decided to try it out with some Mary batiks. I played with color a bit differently in this design. I wanted to try making the background of the design dark and I wanted to use the dark brown floral without it taking over and making the design feel heavy. 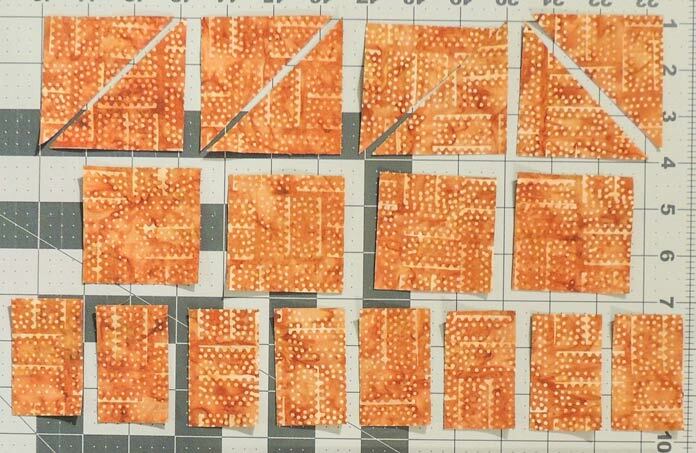 I chose batiks from two different colorways in the Mary line – Rust and Pink. I also chose two Ketan batiks that coordinate with this line to give the eye a place to rest and to keep the focus on the floral prints. Fabrics for the front of the cushion cover. 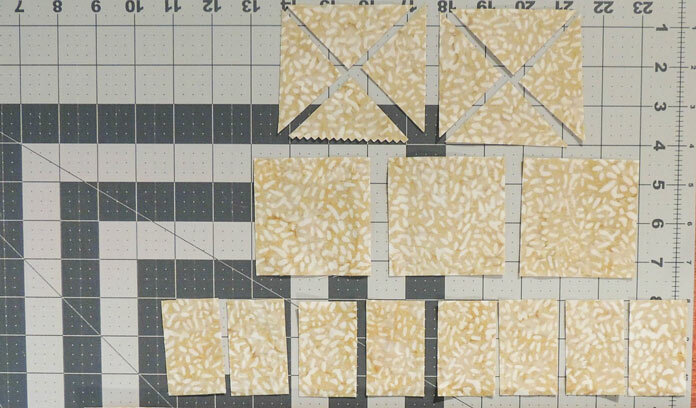 TIP Cut across the squares in opposite directions so the pattern will be maintained when sewn onto the center block. a fat quarter for the top back panel – you’ll see my choice soon! Stay tuned for the rest of the tutorial. The Mary batik line has a beautiful variety of prints that will start coming together to create the center block of the quilted cushion cover in the next post. 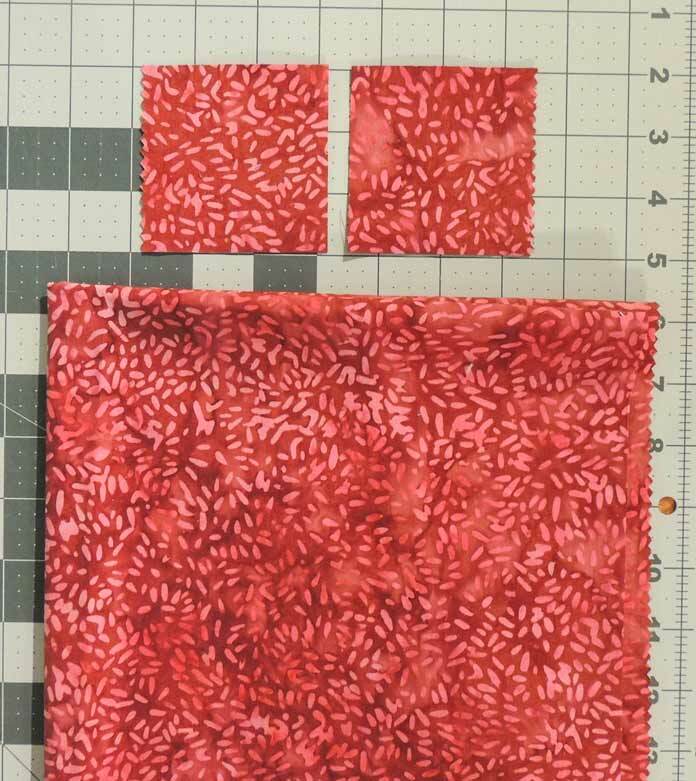 I am using some banyan batik fabric in my cross of squares quilt..the colors shift perfectly to fit in with the shades that are being used. Batiks are Beautiful! And this cushion cover is so effective, I was quite surprised at how it turned out, the colours are so soft and complimentary – love it! Very pretty. I love the colours and the design. Such a lovely summery look! I bought my first Banyan batik, a nuetral, and used it all up for a background. I’m getting more, love it! That’s great to hear, Melody! 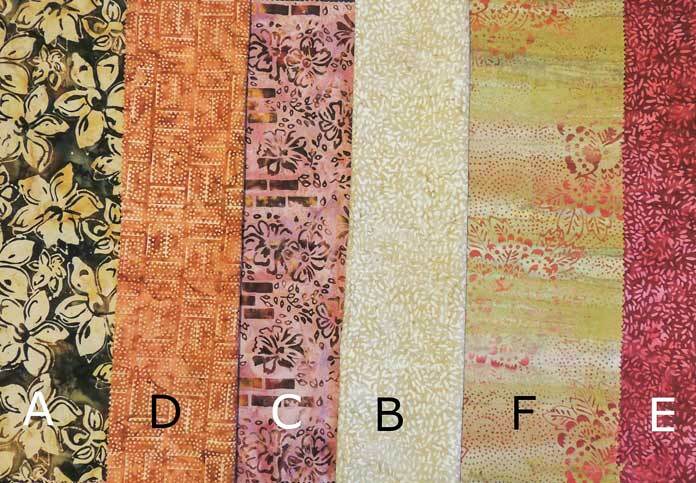 The Banyan Batiks, especially the Ketan batiks, are perfect fabrics to put in any project! 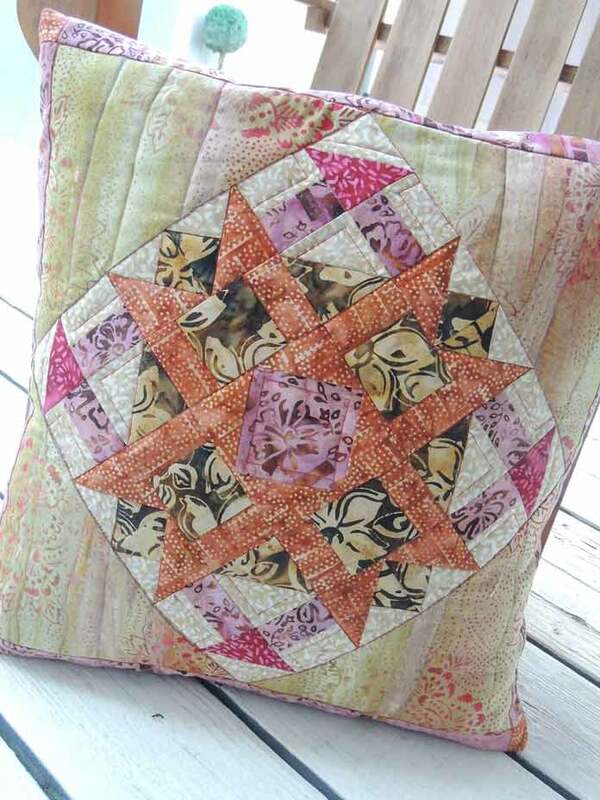 Love this pillow and the fabrics you used. I am starting to love batiks. I think I was afraid to use them before I saw how great they can look in projects! Glad you are like the project and the batiks! The Mary line has some great prints to try out in all kinds of projects.